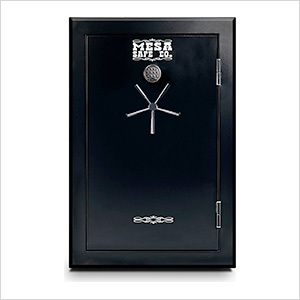 The Mesa Safe MGH39E is a burglary and fire rated gun safe perfect for those who need to protect weapons, valuables and documents. It will hold up to 39 long guns without scopes. There is a 60 minute fire rating tested at temperatures up to 1400 degrees F. This safe features a fully upholstered door panel, walls and shelves (fully adjustable shelving system to fit your storage needs).